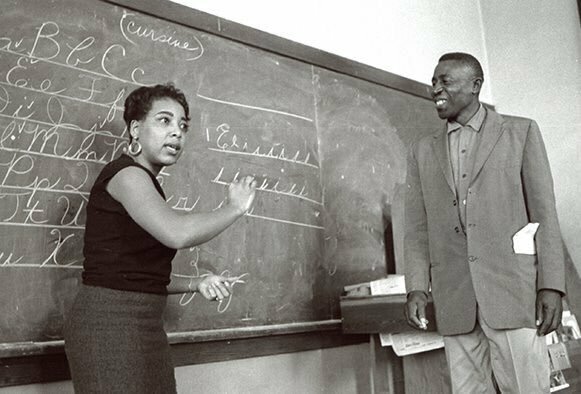 Dorothy Cotton was the director of education for the Southern Christian Leadership Conference during the Martin Luther King years. Credit: Twitter/@natcivilrightsmuseum. All rights reserved. On June 10 2018, the world lost another veteran of the 20th century struggles for freedom and democracy. Dorothy Cotton, director of education for the Southern Christian Leadership Conference, or SCLC, when it was led by Martin Luther King Jr., passed away at the age of 88. As an invaluable member of a legendary team of preachers and organizers, she was one of the few women at SCLC to have served in a senior leadership position. Amid the efforts to register black voters in the segregated South, SCLC came to realize that registration was not enough for a population that had been disenfranchised for centuries. Cotton wanted people to understand the mechanisms of a government that had never really represented them or their interests and, ultimately, make that government their own—a process that would involve much more than voting. I didn’t meet Dorothy until long after she retired from Cornell. In 2012, Vincent Harding had asked me to join a historic delegation to Palestine that was being organized by the Dorothy Cotton Institute. I was uneasy about joining the delegation—which was mainly veterans of the black freedom struggles of the 1950s and ‘60s—but eventually agreed. It was a tremendous honor to be among such a remarkable group. Led by Cotton and Harding, the delegation was, in part, a testament to her commitment to education. Even before leaving, we read, discussed and shared insights. Since the delegation was composed mostly of African Americans and Jews, we delved into the complicated history of relationships between the two groups in the United States. But that was just one part of the journey we undertook together. I had learned about the important role of music in the movement before—that it gave strength and courage to weary and sometimes frightened marchers. I knew of the power of song, but the demonstrations of my generation had more chants than songs. To experience Dorothy Cotton leading us all in song, in an effort to renew our souls on a hot and exhausting day, is among the greatest blessings of my life. It seemed at once an expression of lament and a defiant call to hope. The song represented a strange juxtaposition of time: the story of the ancient Israelites, carried in a song composed by our ancestors while they were enslaved, being sung in a location closer to the original story, but at a time far removed. I will remember her and celebrate her life not only because of who she was in the 1960’s—and the sacrifices of her generation that made my life possible—but also because of all she continued to be. She taught us how to be a citizen and how to be more fully human, even until the end.